We’re making a list and checking it twice because it’s officially 100 days until the NCAA Women’s Final Four tips off in Columbus! As you prepare to celebrate the holiday season, we’re giving you inspiration for those last-minute stocking stuffers. There’s no better present for the basketball lover in your life than Women’s Final Four tickets! Whether you buy tickets to the semifinals, championship game or all three, you’ll be the best gift-giver of the holidays. There are still seats available, but purchase them up soon—they’re going fast. And if you’re coming in from outside Columbus, don’t forget to book your hotel room! The spirit of the holiday season continues well into next year when you can be a part of the Women’s Final Four action! 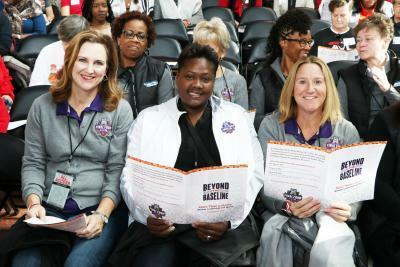 There are hundreds of opportunities to volunteer, from assisting with transportation to Tourney Town, presented by Capital One to the Women’s Basketball Coaches Association Convention (more on that below). And we certainly cannot fill these spots without your help! Register today and check one item off your New Year’s resolution list. Speaking of resolutions…the Women’s Final Four is more than three games. The event also focuses on celebrating the accomplishments of women and girls from the boardroom to the classroom to the playing field. Beyond the Baseline is series of exclusive networking events designed to inspire and engage local professional women and business leaders. Make the New Year great and join us for a FREE event on Jan. 11, Gender Bias in Athletics. While you’re on holiday break this season, start training for Dribble to Work Day! Established in 2015, Dribble to Work Day has raised awareness for the Women’s Final Four using social media on Selection Monday. Fans can participate in the excitement by dribbling a basketball into work, capturing it on video and sharing it on any social media platform. 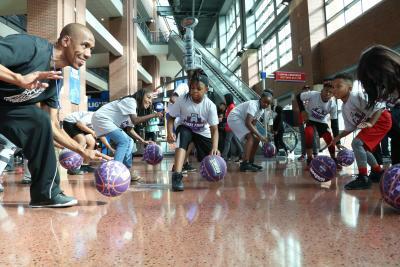 This year’s Dribble to Work Day will be held on March 12, and we can’t wait to see how creative fans will be! In years past, professional and collegiate athletes, celebrities, influencers and fans have all participated in the fun. Who knows—if you get really creative with your video, you could even end up on ESPN! If you’re a former Women’s basketball player and interested in attending the Women’s Final Four, there are opportunities to not only watch amazing basketball, but also participate in exclusive events! To recognize the student-athletes who helped build women’s basketball, join the NCAA for AlumNation, a special ticket package that includes pregame hospitality, reward points, suite access and an all-access ticket. Buy your special ticket today! Picture it: thousands of kids dribbling basketballs in unison from McFerson Commons to the Greater Columbus Convention Center. Sounds like a crazy good time, right? We think so too. The NCAA Bounce, a fun and FREE event, is open to all kids 18 and under, with registration beginning in January. And as an added bonus, all participants get a free basketball and t-shirt! We’re showing off the city for some pretty special guests in March! Over 2,500 coaches will converge on the Greater Columbus Convention Center for the Women’s Basketball Coaches Association (WBCA) Convention during the Women’s Final Four. Some of the best and brightest minds of the basketball coaching world will learn and teach with one another, attend the games and explore Columbus. You’ll see these coaches around the city, so be sure to say hello and let them know your favorite places to eat, shop and play! With only 100 days to go, it’s hard not to get excited for all of the basketball festivities surrounding the Women’s Final Four. Whether you attend the games, volunteer, participate in the community events or all of the above, there are so many ways to make your 2018 Women’s Final Four experience merry and bright.